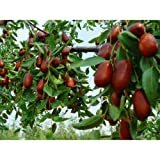 Jujube trees for sale – Easy plant to grow, with edible fruits and also can be used as edge plant, planting in winter to spring, better to buy grafted tree or another option to start from seeds yet more problematic it’s impossible to ensure the quality of the fruits. 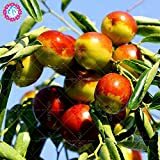 Jujube trees for sale – What is the best way to start growing Jujube fruit tree? Jujube trees possible to start from seeds, cutting or basal shoots, but for some varieties like Li and Lang it isn’t possible to start from seeds the seeds not viable.